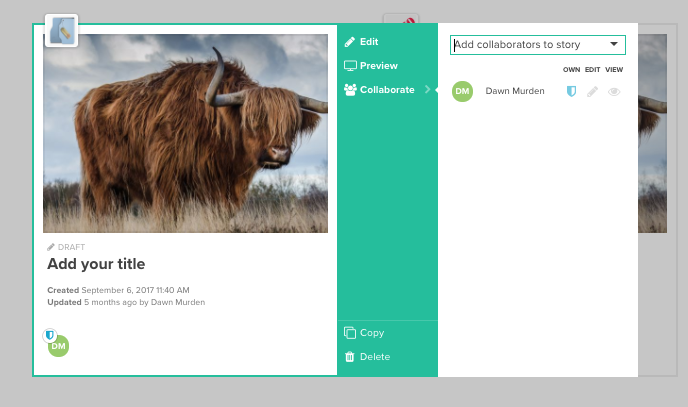 For stories you create, you can invite other registered members of your team as collaborators with different permissions: either view-only, edit or take over as the story owner. To do this, return to your dashboard and hover over one of your stories. Select 'Collaborators' from the green menu. When you create a story, by default, your name will be shown in the 'Collaborators' menu with a blue icon marked 'OWN' indicating that you are the owner of the story. Click into the search field to select fellow team members, and then set their access level from the options available. Setting someone to 'Edit' will enable them to see the story on their own dashboard and be able to open the story and edit its content. Setting them to 'View' will show the story on their dashboard where they will be able to preview the story, but not edit it. Setting a user to 'Own' will transfer the ownership of the story to them and your status on the story will change to that of an editor. The new owner of the story will now have the ability to not only edit the story, but also to control who has access to it. You can also add collaborators from directly within the story editor. When you use this method, the collaborators you add will be assigned 'edit' permission by default. I am working on this story with a colleague, how can we both contribute?